Download ReportImmigrant integration policies that are designed for migrants to Europe, particularly newcomers, are important, but they can be insufficient over the long run to realize the full economic potential and societal participation of immigrants and citizens with an immigrant background. 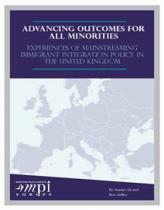 For this reason, several European governments have increasingly turned to the strategy of “mainstreaming” integration—an effort to reach people with a migration background through needs-based social programming and policies that also target the general population—in order to address areas where traditional immigrant integration polices have fallen short. A deeper understanding of mainstreamed policy innovations for immigrants is important to Europe’s immigrant integration efforts, since intended beneficiaries of traditional integration policy (immigrants and their descendants) are no longer a discrete and easily identifiable population—and in some localities they are not even minorities. The second and third generation face some (but not all) of the challenges of their parents, especially in relation to educational and employment success, but many of these challenges are not unique to those with an immigrant background. At a time when public budgets are tightening, governments are articulating new strategies to ensure that the needs of all vulnerable groups are met more effectively through mainstream policy change. Liz and Milica are presenting this work at the COMPAS Breakfast Briefing this week, on Friday 13 June. The UK debate has been obsessed with numbers, limits and caps since 2010, and arguably a generation. This misses the real story of immigration: how immigrants integrate into society. When do migrants cease to be migrants? The integration story is a complex one but its importance cannot be understated: whether or not groups are successfully included will ultimately shape immigration policy. MPI Europe has been interested in what governments can do to encourage such a process. In the UK, policy responsibility for integration is diffused through a range of national and local government agencies, often with unclear or overlapping mandates. In contrast, countries in mainland Europe, such as the Netherlands and Denmark, tend to resource specialised actors within government that design and manage integration policies in isolation from mainstream policy, with clear targets and tailored interventions. As policy-makers in these countries grapple with the need to infuse integration priorities into mainstream policy portfolios across government, what can be learned from the British experience, and vice versa?